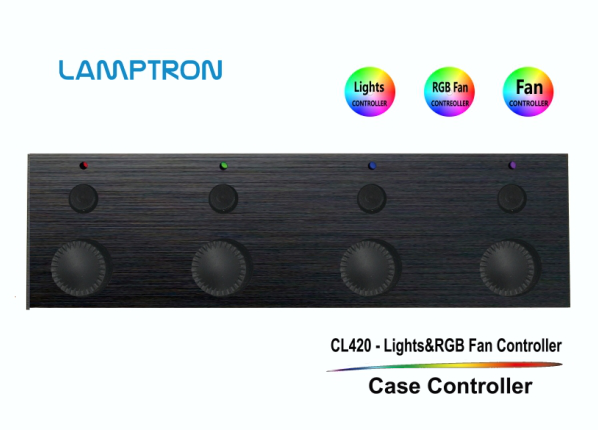 Lamptron introduces the CL420 front-bay RGB lighting and fan controller. The Lamptron CL420 is a perfect all-in-one fan and RGB lighting controller. The Lamptron CL420 is a single slot 5.25-inch front-bay controller which supports both RGB LED strips and the RGB lighting found on chassis fans along with controls for the fans themselves. So if you like controllable RGB LED strips from NZXT or Phanteks but prefer Corsair RGB cooling fans, the Lamptron CL420 will control all of them with ease. No need to install numerous lighting control software on your computer to control multiple RGB lighting devices, control each with a single controller. For more information, visit the CL420 product page at the Lamptron website.